Lovely New Art Gallery Knit Prints! This soft cotton jersey knit has great recovery and the fabulous prints we've come to expect from Art Gallery fabrics! This funky linen basketweave mesh fabric is perfect for summer layers. Make a perfectly comfy loose over-blouse, a cute swim cover-up, or part of an artsy mixed-fabric ensemble! These cute new seersucker fabrics have the perfect, delicate crinkle texture! They make great shirtings, but why not try a dress or skirt too? Or even a pair of ultra-cool summer pajamas? Lightweight cotton lawn, printed chambray, and linen blends are all part of this season's mix. Are you planning your spring sewing yet? These fabrics just might inspire you! Treadlette Tuesday: Melissa's New Quilt - And CLASS! Melissa calls this great strip quilt The Fastest Quilt In The Midwest, and you can learn to make it in her upcoming class! In this 2-session class, you can complete an entire quilt top. It's that fast! Here's the full details. To sign up, call us at (651)698-9690, or stop by the store. We love these cheerful, sweet designs from a new collection called Sugar and Spice. Celebrating all our favorite girly stuff: cartwheels, unicorns, playing dress-up, and flying to the moon! We have some delightful new lawns from Liberty of London - perfect for spring! Whales, squid, narwhals, and more adorn these adorable, nautically-inspired cotton prints. Perfect for your favorite sailor! This soft, plush knit would make great leggings (or jeggings!) but don't let the denim-look limit you. Dresses, skirts, sweatshirts, or jackets would also be fab! Check out this great new cotton panel print featuring totally mod, geometric animal illustrations! In each panel you get 6 different animals, with plenty or border for seam allowance. Ideal for your next quilt. Treadlette Tuesday: Cute Batik Pants! Check out these cute pants made by Treadlette Michele! "These are my new summer jammie bottoms!" she says. "I chose batik specifically because it is so cool and crisp in hot weather. And I made the crop length." She used New Look 6399, which offers skirt and pant options and has a flattering bias-cut waistband. Are you getting a start on spring and summer sewing? 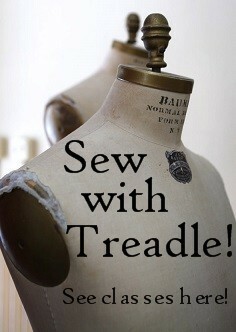 Stop by and get ideas at Treadle! Summer Sewing Camps and Classes for Kids are now open for registration! Have some fun while you learn to use your sewing machine! Make a pillowcase and use your first pattern to make pj pants or a skirt. Bring your sewing machine or use one of ours. Pattern and fabric will be purchased on first day with instructor’s help. Project cost NOT included in class fee and will vary with project chosen. Be creative, have fun and play more with your sewing machine. If you know how to use a sewing machine, you are ready to choose a project from a pattern that will challenge you, but not make you cry. Choose a pattern that inspires you and try something new - like zippers, knits or facings! Enroll in more than one week to complete several garments or for more challenging projects. Project cost NOT included in class fee and will vary with project chosen. Instructors will guide students in choosing patterns. Not a true camp, but a chance to sew all summer long! Come as a new beginner or hone your skills on some fun summer patterns. We’ve chosen the best patterns for summer tops, dresses, skirt or shorts. Take one session or both and complete a summer outfit! Bring your sewing machine (or use one of ours) and basic sewing supplies. Project will be chosen in first class. Project cost NOT included in class fee and will vary with project chosen. To sign up for any of our classes, call us at (651)698-9690, or simply stop by the store. See our full class schedule here. Laurel Burch's designs are a wild riot of color. We have some new fabrics with her amazing illustrations on soft cotton flannel, perfect for pajamas or fun shirts! These floral embroidered chambray border fabrics practically shout Spring!! Place the borders along the lower edge of a dress, skirt, pant, or shirt pattern for an organic design that makes a statement!